FAQ Fridays: What Are Google Signals Within Analytics? What Are Google Signals Within My Analytics Account? As many of you already know, online shoppers can and will use multiple devices when looking for their next new or used vehicle. While they may start out on their mobile phone, plenty of times these potential customers end up transitioning over to a desktop or laptop. This may not seem like a big deal initially, but understanding this activity pattern within your website traffic and the path that your visitors are taking is very beneficial when making future marketing decisions. You want your online dollars to go as far as they can while assisting in generating real leads — and not just engagement metrics. By activating Google Signals within your current Google Analytics account, you gain more insight into your website visitors that previously was not easy to obtain. 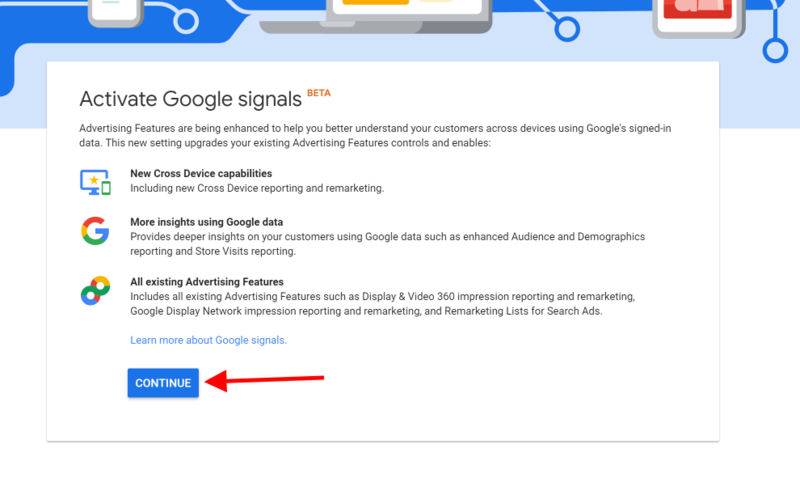 Digging a little deeper, when you activate Google Signals within your Analytics account, it upgrades existing features which will now include more information from Google users who are signed into their accounts on any device. Keep in mind that they will have to have Ads Personalization turned on in order to collect this data. Which Analytics Features Are Upgraded via the Activation of Google Signals? Remarketing with Google Analytics — When you create an audience within Google Analytics and publish it to your Google Ads account, you can then track those users across multiple devices. Advertising Reporting Features — Google Analytics will not collect additional information about users who are logged into their Google accounts and have turned on Ads Personalization. Demographics & Interest Reports — Google Analytics will not collect additional information about users who are logged into their Google accounts and have turned on Ads Personalization. Cross Device Reports — These reports are based on aggregated data from users who have Ads Personalization enabled and models behavior for your entire user base across all device types. This is based on user data — and not session — and the behavior modeling does not require user-ID views as in the past. As you can see in the Google Signals help document, Google tells us why the user has to have Ads Personalization enabled to bring in extra data. How Do Google Signals Work? As you know, Google collects data (as much of it as they can). Their main business model is to sell advertising based on the data they collect from the people using their various platforms and third-party partnerships. When a user is logged into his or her Google account, it is very easy for Google to then track and store what that user is doing online. All of that data is tied to that user's account, no matter if they are logged in on their mobile phone, tablet, or computer. This is how cross-device tracking is done. Since Google knows what you were doing on your phone, once you are logged into your desktop it will continue to collect data for your account. So when little Timmy visits your website from his desktop on Saturday, he is classified as a new user. When he then goes to your website again on Monday from his smartphone, he will be considered a returning user on mobile. What Kind of Reports Are Built In? How Can I Use Google Signals? You will need administrative access to your dealership's Google Analytics account. From here, you can click on the "Cross Device" navigation item (shown below), which is found under your "Audience" tab. Selecting the "Cross Device" navigation button under the "Audience" tab starts you off on the path to unlocking the power of Google Signals. Alternatively, you can access it from your admin panel by going to the "Property Settings" tab, selecting "Tracking Info," and then choosing "Data Collection." Google will then bring up the screen displayed below, where you will need to click on the "Get Started" button. Digging into your "Property Settings" tab is another way to access the option to turn on Google Signals in Your Google Analytics Account. At this point, you will find yourself on the "Activate Google Signals" screen. From here, go ahead and hit the big blue "Continue" button. Pressing "Continue" takes you to the next step of this process. Whether you have one website property in your account or several under your purview, I highly suggest that you activate Google Signals for all of these properties. 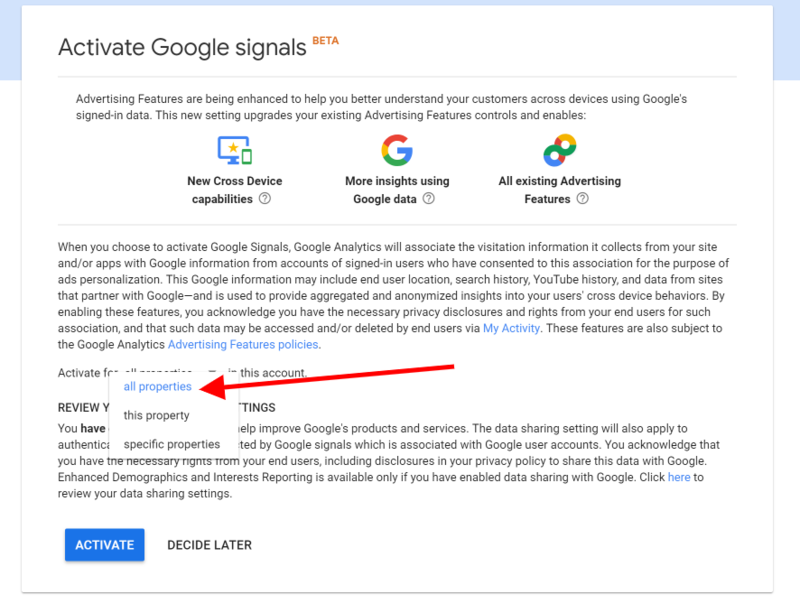 Once you've decided which properties you'd like to activate, simply click the "Activate" button and your Google Analytics account will now have the Google Signals feature turned on and ready to go. Make sure to decide on which properties you'd like to activate this feature for before clicking the "Activate" button. Keep in mind that once you activate Google Signals within your account, Analytics will only then start to collect the data from this point forward; you will not be able to see any historical data since Google Signals was not enabled. If your dealership needs help with enabling Google Signals within Google Analytics, contact us today and we can get you set up and enjoying this potent source of consumer data in no time.